Training camps are now in full swing, and people are focusing, as they almost always do, on offense. That’s not a surprise. In our pass-happy era, quarterback play naturally takes precedence over other parts of the game. Many even believe that the quarterback is the sole barometer by which a team’s playoff chances can be measured. Teams haven’t been handicapped based on defense and the running game for quite a long time. This brings me to the NFC West. We all remember the NFC Championship game. Two late special-teams turnovers likely prevented the San Francisco 49ers from playing in the Super Bowl. That team was built with an emphasis on defense and the run game. No NFC team ran the ball more than the 49ers in 2011, and no 16-game starter threw fewer passes than San Francisco quarterback Alex Smith. Theirs was the only team in the conference to run more than it passed. The defense allowed the fewest yards and the fewest points in the NFC. They led the NFL in takeaways and turnover ratio. The 49ers’ template was evident. One can debate the importance of individual plays or moments, but clearly San Francisco’s foundation is built on a stout running game and a dominant defense. The 49ers’ nickel sub-package stands out. Two players in particular impressed on film: defensive end Aldon Smith and cornerback Chris Culliver. Smith’s rookie success was well documented. What made it more impressive was that he played almost exclusively in the nickel; with the exception of a few regular-season snaps, he did not play in the base 3-4 defense. Culliver became the team’s third cornerback in a Week 5 game against the Tampa Bay Buccaneers. He played on the outside opposite Tarell Brown, with Carlos Rogers playing inside over the slot. “Two man” (two safeties are deep with man-to-man against the five eligible receivers) became a staple coverage for the 49ers, proving highly effective. San Francisco was able to generate a consistent pass rush with four-man pressure, utilizing multiple fronts that featured players with tremendous positional versatility. Defensive end Justin Smith was the most visible example of such a player, but he wasn’t the only one. Defensive tackle Ray McDonald also played at a very high level before being hurt midway through the season. It’s funny how things work out. The New York Giants took the lead against the 49ers in the fourth quarter of the NF Championship Game when Eli Manning connected on a touchdown pass with Mario Manningham. The 49ers had been in a “dime” package, which they did not utilize that often, at the time. They also rushed three and dropped eight in coverage, while Tramaine Brock (filling in for an injured Brown) was beaten by Manningham. The other element that defined the 49ers’ nickel was the use of linebackers Patrick Willis and NaVorro Bowman. They were the only 3-4 inside linebackers in the NFL who stayed on the field in the sub-packages. Both played more than 90% of the total snaps. Willis is the most complete inside linebacker in the league, but there were stretches throughout the season in which Bowman played even better. One can argue that the 49ers have recognized a need for a more explosive passing game, as the off-season acquisitions of receivers Randy Moss, Manningham and draft-pick A.J. Jenkins would indicate. But one can also be more explosive out of base personnel in normal down and distance situations. A team does not need to put the quarterback in the shotgun and spread it out with three and four wide receivers to engineer big passing plays. The Seattle Seahawks appear to be following a similar path. Yes, they have a high concentration of quarterbacks after signing Matt Flynn, selecting Russell Wilson in the third round of April’s draft and retaining Tarvaris Jackson (a much improved player last season, Jackson is also the most talented of the three). But the foundation is running back Marshawn Lynch. Lynch carried the ball more than 20 times in eight of Seattle’s last nine games in 2011, averaging more than 100 yards over those games. There is no reason to believe the Seahawks won’t take a similar approach in 2012. The Seahawks’ draft choices in 2012 speak to their philosophy. They selected 10 players, eight of them defensive, including pass rusher Bruce Irvin in the first round and linebacker Bobby Wagner in the second. The Seahawks clearly see themselves as a team built around defense and the run game. The selection of Irvin and the signing of defensive tackle Jason Jones strongly suggest a parallel to the 49ers’ defensive approach, and again speak to the importance of the nickel sub-package in the NFL today. Irvin can become a “joker,” a movable chess piece that aligns in different spots, similar to the role Smith played in San Francisco a year ago. Jones can play inside and outside, and provide an effective pass rush anywhere along the line. Wagner and K.J. Wright can team up as the nickel linebackers. The Seahawks want linebackers who are athletic and rangy, possessing the ability to play in space; Wright (a draft pick in 2011) and Wagner both fit that description. No discussion of the Seahawks’ defense is complete without a mention of the secondary, especially cornerbacks Richard Sherman and Brandon Browner. Sherman is 6-foot-3, Browner is 6-4, making them the tallest pair of corners in the NFL. Seattle played a lot of press man coverage last season, and the Seahawks will again in 2012. Sherman was particularly strong as a press corner; he showed good ability to change direction, possessing deceptive quickness and speed. His matchup with Cincinnati Bengals receiver A.J. Green was much talked about. Sherman’s performance has been exaggerated by some (he was beaten on what should have been a fourth-quarter touchdown, but Bengals quarterback Andy Dalton badly underthrew the pass, allowing Sherman to make a play that resulted in an interception by Kam Chancellor), but he was able to keep up with one of the NFL’s best receivers. Overall, I liked what I saw out of Sherman in 2011. He has a chance to be a very good man-to-man corner. I would be remiss if I did not mention the Arizona Cardinals. Few take the Cardinals seriously because of their questionable quarterback situation, but they won seven of their last nine games in 2011. What keyed those victories? You guessed it: the running game and, especially, defense. In their last eight games, Arizona allowed an average of just 190 passing yards. 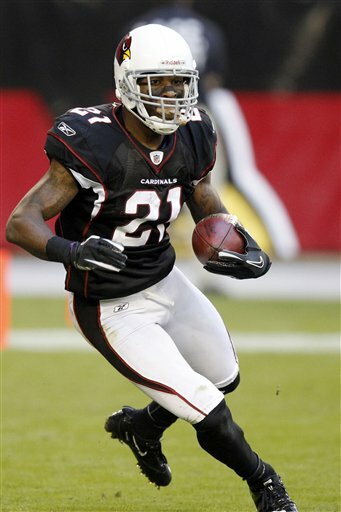 A significant factor was the development of cornerback Patrick Peterson. Those who watched him struggle early as a rookie missed his considerable improvement over the second half of the season. There were many games down the stretch in which Peterson played what I used to call the “Deion” coverage (now played primarily by New York Jets standout Darrelle Revis). A man-to-man coverage with no safety help, it’s essentially “cover zero,” with the rest of the coverage primarily in a zone, although man concepts are also utilized. The Cardinals then had an extra defender available for coverage or pressure. This was a staple of their defense later in the season. Many might remember Peterson’s head-to-head matchup against Dallas Cowboys receiver Dez Bryant in Week 13, which Peterson clearly won. There’s no question that Peterson is an ascending player. He gives Cardinals defensive coordinator Ray Horton tremendous flexibility with regard to both coverage and pressure concepts. It’s always easy to say a team will go as far as a quarterback takes it. There’s no question that playoff success depends on having someone who can make big-time throws in critical situations. San Francisco 49ers coach Jim Harbaugh, Seattle Seahawks coach Pete Carroll and Arizona Cardinals coach Ken Whisenhunt know that. However, whether out of necessity or due to philosophical inclination, all three coaches have chosen to focus on defense and the running game. It will be interesting to watch these three teams, given their respective schedules in 2012. They all play against a number of high-powered passing offenses, providing an enticing contrast of the old school with the new wave. Let the games begin.